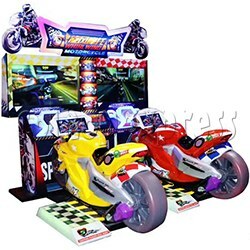 Whirlwind Motorcycle Driving-Riding Game is a video motion motor racing game machine that designs for single play mode and link up mode for option. Features with support linked up to three players for exciting competition game play, bring players super-realistic simulator ride experience. Machine installed two high definition LCD screens for show the excellent game graphics, the wheel design with gorgeous LED twinkle effects, its brightness dazzles the eyes, get people's attention. Player inserts the coins, choose the single play mode or link up mode and start the game. During the game, player holds the handle and stamp on the pedals, use the body control the realistic motorcycle body to control the motorcycle forward in the game, press the button to accelerate in a short time, players can enjoy the exciting motorcycle games.